Mike Pompeo, Trump’s new American secretary of state, voiced a strongly worded message of support for Israel as he came to meet Prime Minister Benjamin Netanyahu Sunday on first trip to the Middle East as secretary of state. The discussions, unsurprisingly, focused on Iran, its actions in the region, as well as the nuclear accord that President Donald Trump has threatened to walk away from by May 12th if serious changes are not made. Pompeo and Netanyahu apparently see eye to eye on these issues. In a joint news conference, Pompeo called Israel “an incredibly important partner.” He also stated, “We remain deeply concerned about Iran’s dangerous escalation of threats to Israel and the region and Iran’s ambition to dominate the Middle East remains. The United States is with Israel in this fight,” he declared. Speaking Thursday at the 66th annual National Prayer Breakfast in Washington, D.C., President Trump spoke about the link between faith in God and national greatness. 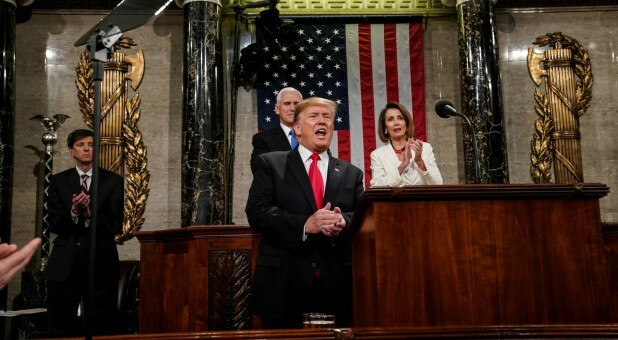 “As long as we open our eyes to God’s grace and open our hearts to God’s love, then America will forever be the land of the free, the home of the brave, and a light to all nations,” said Trump. “Our rights are not given to us by man, our rights come from our creator. No matter what, no earthly force can take those rights away,” stated Trump. Trump’s remarks were part of the annual National Prayer Breakfast, a major DC-area event that features several members of Congress, world leaders, religious leaders, and other honoured guests. “We eat, we sing, we share praises and prayer needs. Then one of our members shares their stories and we pray,” explained Hultgren as part of opening remarks. “I wear it every day. I do so to remind myself that even in this noisy, conflicted, and sometimes acrimonious world of politics, that we want to treat everybody, everybody the way that we would like to be treated,” said Crist.